The DataGauss LG offers all the benefits of the best-selling DataGauss an automatic hard drive and back-up tape degausser which also comes fitted the unique Data Destruction Auditor solution which enables the user to document and verify their hard drive sanitization/erasure and create data protection audit-ready reports. The DataGauss LG degausser erases hard drives and back-up tapes quickly and effectively with its powerful 9000 gauss force. 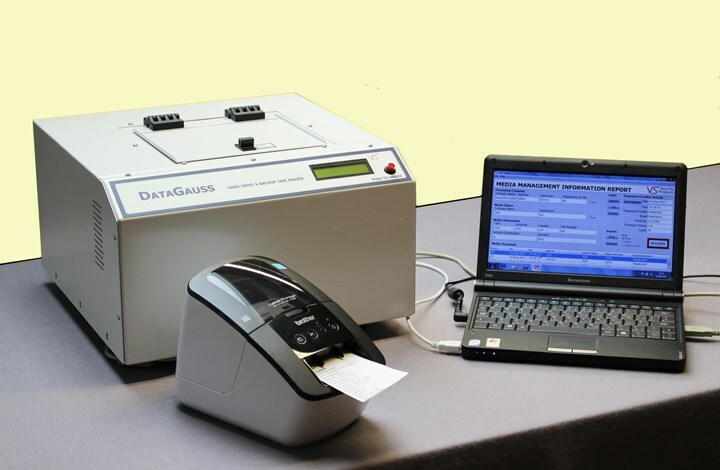 The DataGauss LG self-calibrating degausser provides the user with assured erasure time after time. If you’re looking for fast, reliable and permanent erasure of medium quantities of hard drives and tapes but with the added bonus of being able to produce tangible evidence that media has been completely erased, the DataGauss LG is one of the best hard drive erasers on the market. hard drives & back up tapes.